Over the weekend we took Caleb and his Dad, Darren, up to the White River near Sylamore Creek for their first fly fishing trip. 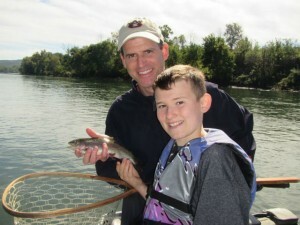 We always really enjoy father and son trips and these two became our number 18 & 19 anglers this year to catch their first trout on a fly. The water was a bit off color and quite low but it was a beautiful fall day and the trees are just beginning to show a little fall color. Most of the fish were taken on #14 RG/PT Cruisers, #14 Crispy Creme Sowbugs and #18 black Zebra Midges. 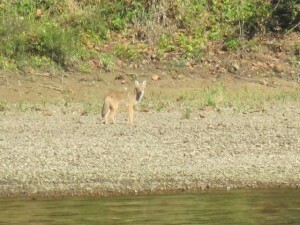 We got an extra treat when we ran into “Wylie Coyote” cruising the river bank looking for a meal. He finally found a big ole crayfish on the edge of the river and we actually got close enough to hear him crunching on it. 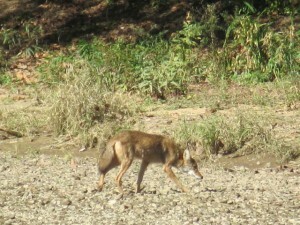 I think we can all agree that a Coyote is not nearly as handsome as a yellow Labrador Retriever!! I gave him a good growl just to make sure that ole Wylie was not thinking about getting in our boat.